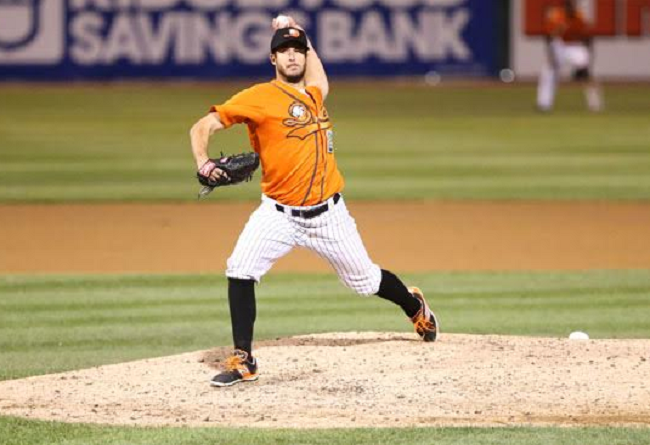 The Long Island Ducks defeated the Somerset Patriots 5-4 on Thursday night in Game Two of the 2015 Liberty Division Championship Series at Bethpage Ballpark. The teams are now tied in the best-of-five series one game to one. Long Island posted the game’s first run in the second. Cody Puckett’s sacrifice fly off Patriots starter Mickey Storey put the Ducks in front 1-0. In the fourth, a pair of runs extended the lead to 3-0. A sacrifice fly from Dan Lyons and a RBI single to left from Puckett padded the Ducks’ lead. Somerset took a late lead with four runs in the eighth. Robert Andino’s RBI single off Ducks reliever Ricardo Gomez made it a 3-1 ballgame. Ducks first baseman Sean Burroughs then made a run-scoring error, before Matt Fields hit a two-run double to left to give the Patriots a 4-3 lead. The Ducks responded to tie the game in the bottom of the inning when Patriots reliever Daniel Sattler threw a run-scoring wild pitch. Burroughs’ RBI single to right in the same frame helped the Ducks retake the lead 5-4. J.C. Romero completed the win in the ninth. Romero (1-0) picked up the win, allowing one unearned run on one hit in one and two-thirds of an inning. He walked and struck out one. Sattler (0-1) suffered the loss. He surrendered one run without allowing a hit in one-third of an inning. He also walked and struck out one. Both starters took no decisions. Downs went seven innings and did not allow a run on two hits while walking two and striking out seven. Storey finished with seven and one-third innings pitched, giving up four runs on six hits with three walks and five strikeouts. Burroughs had three hits to pace Long Island, including the game-winning RBI single. He also scored once. Randy Ruiz had a pair of hits and two runs scored in the win as well. The Ducks now travel to New Jersey for the remainder of the best-of-five Liberty Division Championship Series, beginning with Game Three on Friday night. Game time from TD Bank Ballpark is slated for 7:05 p.m. Right-hander Bobby Blevins gets the start for Long Island against Somerset southpaw Matt Zielinski. Fans can follow all of the action live on the Ducks’ flagship radio station, 103.9-FM LI News Radio. Live streaming audio will also be available online by CLICKING HERE.